than your home is your time. Catskill Concierge is the only resource you’ll ever need. We offer a comprehensive range of homeowner and personal services, but ultimately we provide peace of mind. No request is too big, no detail too small. From managing renovations to overseeing repairs, from stocking your fridge to landscaping your property, our services are all about finding the best solution. And, because we’re former city dwellers with plenty of upstate experience, we’re experts at exceeding the aesthetic and practical expectations of a highly discerning clientele. Catskill Concierge makes sure that your home is impeccably cared for and maintained, whether you are away—during the week or for longer stretches—or comfortably ensconced. We coordinate, schedule, and supervise every aspect of home maintenance, including housekeeping, landscaping and pool services. Frequent home inspections ensure safety from weather and security-related events. We accompany all repair or maintenance recommendations with a suggested action plan, so you are always the final arbiter. Catskill Concierge will perform, advise on, and arrange for virtually anything you might need. We can arrange pet care, accept deliveries, reset timers/water heaters/air conditioning, hang your holiday lights, schedule a massage, even help you with your entertaining, from intimate dinners to big parties. No matter how ordinary or unusual the request, we can make it happen. Catskill Concierge provides competitive bids, contract management, and on-site supervision for jobs of every scope, from small repairs to large-scale restorations. We bring in vetted and trusted professionals to ensure all work is of the highest quality. Alan Li is the founder of Catskill Concierge. As a former technology executive and New York City resident, he does not operate on “country time.” Now an owner and manager of numerous Catskill properties, Alan has developed a deep network of trusted local professionals he relies on to perform to his high standards. As a Certified Home Inspector licensed by New York State, he has the expertise to make sure the work is both necessary and done right. Anna Li is co-founder of Catskill Concierge and head of property development. She is a former executive at Condé Nast in London, Sotheby’s in Amsterdam, and the Financial Times in Europe. After moving to the U.S. two decades ago, Anna ran an interior design firm, Haute Décor, in Great Falls, Virginia. Wanting to totally refurbish homes from the ground up, she next opened Nest Egg Designs, a licensed general contracting and design firm focused on interior renovations. She has remodeled small apartments, large mansions and everything in between. Her specialty is adapting homes to reflect a modern lifestyle by revising floor plans, enhancing spaces and improving flow. Catskill Concierge was recently featured in DV8-Mag! "Catskill Concierge is known as a good company to work with. Wherever possible, I try to give them preferential treatment." "In addition to being a good customer, Alan cares about our community and believes in the importance of personal integrity. I am confident he will always do the right thing." "Catskill Concierge is a great resource for busy second homeowners. 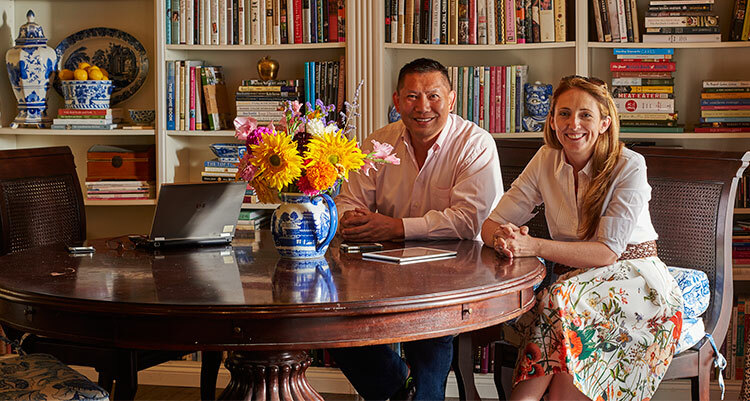 As former NYC residents, the owners of Catskill Concierge understand the needs of city people. Moreover, they have local knowledge and resources; they understand how things work, and can get things done efficiently. From my day job, I know second homeowners are an important part of the economic base of this region and, as a neighbor to several second homeowners, I know Catskill Concierge provides a service that allows them to enjoy their homes without worrying about maintenance and management. Catskill Concierge provides the solution to overcome this obstacle to second homeownership." "My experience with Catskill Concierge has been a joy. Alan is professional, skilled, reliable and affordable. He provides my family the security and peace of mind that our valuable assets are under considered care." "We purchased our second home last year and hired a normal property manager. After several months, we became totally dissatisfied and then switched to Catskill Concierge. They took stock of our issues straight away. No job was too big, none too small. This is a true concierge service and not just a property manager." "Alan at Catskill Concierge has been a great resource for our second home. As a weekday NYC apartment resident, home maintenance is not something I have had to worry about. Since he is a licensed Home Inspector, I am confident that I am getting good impartial advice and with his oversight I know that the contractor has done a good job." We always respond to messages within 24 hours, if you have not heard from us, please check your spam folder.